As I said, that’s the short story. One of my friends asked me what my “secret” was. As I thought about how to answer that, I realized that while there isn’t a secret, there also isn’t a simple answer. To a certain extent, I was a victim of my own metabolism. For the first 20 years or so of my life, I was the kind of person that everyone who wants to lose weight hates. I could (and did) eat anything. During band camp, I was legendary for being able to inhale a large cheeseburger in about 5 minutes. I got some amount of exercise (again, band), but honestly not much. Best I can tell, I simply burned everything I ate. When I graduated from high school, I was as tall as I’ll ever be (about 5′8″ or so), and I weighed 125 pounds. I was a toothpick. Moral of that story: unlike people who struggle with weight during childhood, I never had to learn about being careful what I eat. I also never picked up any kind of aerobic activity that I enjoyed. About the middle of my sophomore year of college, whatever magic I had simply went away. I can’t give you numbers, because I pretty much never weighed myself, but I can tell you that I started getting rounder at that point. There were probably some minor ups and downs in there, but I pretty much spent the next 14 years gradually gaining weight. You can see it in my pictures. I don’t know what my peak was, but as of last October 2, I weighed about 227 pounds. 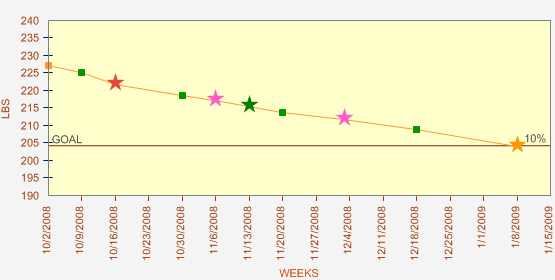 Worse, because of my diet and my utter lack of exercise, I unsurprisingly had a pretty bad blood cholesterol problem. I can’t say it snuck up on me. I knew I was unhealthy, but I also knew what I needed to do to fix it, and I dreaded it. I wasn’t living in denial. I was simply ignoring the problem. Fixing it was going to be hard. It was going to take work, and I wasn’t willing to do it. Years ago, Amy started on a serious program of exercise and healthier eating. I was encouraged by her enthusiasm and success, and I jumped in whole-hog. I made strict changes to my diet. I signed up at the gym and had sessions with a trainer. I was on a schedule in the gym 6 days a week doing cardio work and serious weight training. I wasn’t paying attention my weight (because weight is a bad yard stick when you’re trying to build muscle), but I know I was steadily improving my numbers on the weight machines. That all lasted about a month and a half. The exact morning my trainer went in for planned surgery (and thus was going to be unavailable for a few weeks), I had a big setback in the gym. My shoulder began to hurt after the pec fly exercise, and then a few exercises later I became suddenly drained and exhausted, my heart racing like crazy. I went home and just laid on the bed for about a half hour, waiting on my heart to calm down. I was discouraged. I couldn’t ask my trainer about it. I knew I had my wisdom tooth extraction coming up in just a few weeks, which was going to set things back anyway. So, everything just dropped. There’s something really intellectually satisfying to me about figuring out exactly how I’m going to solve a problem, getting all the pieces together, and tackling it head-on all at once. The problem comes in when either I can’t come up with a plan that I think will take me all the way through, or something about the plan doesn’t work. I end up stalled before I even start, or I get discouraged and instead of adjusting the plan, I give up on it. After enough times of making big plans, announcing them to people, and then falling on my face, it gets easier just to decide not to do anything at all. That’s about where I was last year: knowing I was terribly unhealthy but afraid to fail at doing something about it. I heard about my employer offering a free starter series of on-site Weight Watchers meetings to employees. I was interested but hesitant. I’m not really sure what it was that tipped me over the edge and made me decide to try it, but I did. I decided I was going to start with the food. Exercise is another problem, and if I try to put too many balls in the air at once, I’m just going to drop them again. Changing my diet in the kind of drastic and meaningful way that would help (and would meet what WW said I should be eating) was going to be a HUGE change. That was last October. He asked what my secret is. There’s no secret. In one respect it’s very simple. I’m eating much less and much better than I was 3 months ago. I drink almost nothing but water. I try to eat a lot of fresh fruits and veggies most days. I plan the rest of my food to limit calories and fat. That’s the objective reason I’ve lost 23 pounds. What that doesn’t say, of course, is why… why I decided to do it, why it’s working this time. I don’t know. The Weight Watchers plan certainly helped kick-start me. Their “points” system made it simpler to figure out about how much I should eat, and we’re using their recipes for most of our dinners. Honestly, though, I’ve pretty much stopped tracking my exact points, and I’m still losing about the same amount of weight. The positive support at the meetings is a good thing, but I don’t think it’s the “secret.” At any rate, weight is the only thing they measure, and that’s going to stop being the right thing to measure once I get into a serious weight training program. Amy has helped tremendously. She has really helped me with shopping and cooking dinners, and she eats the food with me. At some level, though, all I can say is that I just decided to do it this time. I’m not trying to fix everything at once, which I think has really helped. I’ve slipped a few times and gotten away from my good eating, and each time I’ve managed to get back on the proverbial wagon. I’m so proud of you! You know I’ve had good results with WW too–I’m convinced the secret is using their recipes to continue eating well! That’s a good goal – 10%. Congrats for keeping up with it. I dropped 30 cholesterol points (all on the bad side) by upping my fiber intake (including taking a couple of fiber pills a day) & taking 2-4 Omega-3 fish oil pills a day. Medication didn’t help & neither did watching what I ate. Yeah. It’s the “default” one WW starts you with unless you pick another one. Apparently, there are some studies that show that you can meaningfully reduce your risk for heart disease and diabetes by losing just 10%. For me, that’s probably about 25%-33% of the total amount of fat I need to lose. I’m not sure where my final goal will be. With my current musculature, I probably shouldn’t weight much more than that original 125 pounds, but I don’t want to look like a stick again. I need to build some muscle and shape (also, if I build muscle, it will help burn calories). If I was to guess, I would say that I need to end up closer to 150-160 or so. Yeah. Believe me, I went back and scoured your old posts looking for recipes. 🙂 I didn’t find a lot that were really useful for us right now. Time is a big factor, and so is the need to feed only two people. We’re using a LOT of crock pot recipes: soups, stews, etc. They can usually be cut down, they’re pretty healthy, and they refrigerate and make good leftovers.